When is a five-win season progress? When you won only four games the season before. The Los Angeles Chargers (that still doesn't sound right) are just 9-23 in their last two seasons, squandering what were likely the final two years of Phil Rivers' prime. The soon-to-be-36-year-old quarterback has a new city and a new coach. But he's still weighted down by the same shoddy roster that's only made the playoffs once in the last seven years. 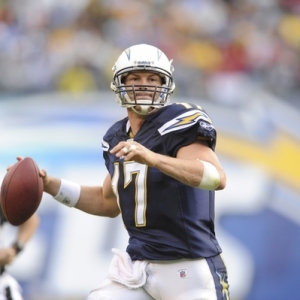 The Chargers haven't done Rivers any favors with the way they've constructed the offense. The offensive line is shaky at best (and that's an upgrade from two seasons ago). His three best weapons are aging Antonio Gates and injury-prone starters Keenan Allen and Melvin Gordon. It's not good. But Rivers was still good enough to get them into the Top 10 in scoring last season and the Top 10 in yards in 2015. Defensively, Los Angeles (still sounds weird) is still a mess. They are shifting from a 3-4 base to a 4-3 under new coordinator Gus Bradley. The Chargers will benefit from a full season of man-beast Joey Bosa rushing the passer. Pressure from Bosa and Melvin Ingram should help keep the pressure off their paper-thin secondary. The linebacking corps is inept, but I do actually expect a little improvement for this group as a whole. If the Chargers are going to improve this season, it comes down to one thing: turnovers. They turned the ball over a ridiculous 35 times last year, and over the past three years they've averaged a pathetic 28.3 turnovers per season. A lot of that is on Rivers. But it is an issue that has to be addressed team-wide. Los Angeles was an atrocious 1-6 in games decided by four point or less or overtime. That includes blown fourth-quarter leads against Kansas City, New Orleans, and Tampa Bay, as well as another missed opportunity against the Raiders. As a result, the Chargers came up nearly three wins short of their Pythagorean Win Total. I'm not bullish on Anthony Lynn or the new L.A. Chargers (nope, still not used to it). But I do think that they are a bit undervalued. The Chargers open the season with three of four games at home, so they have a chance to build some momentum in their new town. They also have winnable late-season games against Jacksonville (after a bye), Buffalo, Cleveland and the Jets. I don't think San Diego has enough to threaten in the deep AFC West. But I do think they will threaten .500, and I like this team to go 'over'. Robert Ferringo has been the top football handicapper in the country the past five years, earning nearly $14,000 in total football profit. He has also posted five of seven winning seasons (including a winning 2016-17) and Robert tallied over $20,000 in football profit between 2011 and 2016, including his amazing 2013 NFL season in which he hit 62.1 percent (95-58). Robert has produced 18 of 29 winning football months and an amazing 41 of 64 winning football months over the past decade. Robert has eight of 10 winning NFL preseasons and he is at nearly 60 percent winners over his last 800 totals picks. Also, Robert's proprietary KING College Football Betting System has posted three of five winning seasons Robert is looking to follow up a winning 2016 with more profit this fall. SIGN UP HERE TODAY AND TAKE ADVANTAGE OF OUR EARLY BIRD SPECIALS ! We are offering new clients $60 in free college football picks for Robert's picks or any Advisory Board handicapper of your choosing. Get your free college football picks now ! Expert NFL Handicapping: Do Cleveland Browns Moves Make a Super Bowl Contender? Which NFL Teams are in the Market for a New QB? Expert NFL Handicapping: What Does Future Hold for Patriots? NFL Betting and Handicapping: Can LA Rams Bounce Back? 5-U NBA! 28-13, 69% Run!